Verseo 18-in-1 Multifunctional Stainless Steel Tool offers useful functions, including ax, bottle opener, chisel, saw, file, flathead screwdriver, hammer, knife, pliers, Philips screwdriver, wire stripper, wire cutter and 6mm, 7mm, 8mm and 10mm wrench sizes. This gadget is extremely useful as a Compact Emergency Toolkit when going camping or making quick fixes around the house. With 18 functions at your disposal, the Verseo 18-in-1 Multifunctional Stainless Steel Tool is perfect for any emergencies and tasks that come around unexpectedly. No need to carry a toolbox when you can do almost anything with this 18-in-1 multi-tool. It's also a Great Gift for Outdoor and Adventure Lovers. 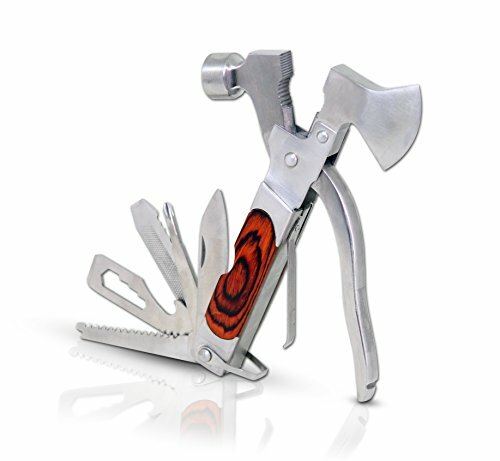 If a friend or loved one is into outdoor adventures and camping, then this multi-tool will no doubt make a great gift for them. Get Out of Emergency Situations Fast! Being in an emergency or accident can be a frightening thing. When stuck and unable to get out of the car, use the knife to cut the seatbelt. Break the car window with the hammer and get out of the car into safety. Remember, when breaking the car windows, the four corners and edges are the best points to hit with the hammer. With its Rust Proof and Sturdy Design, the Verseo 18-Function Multi-Tool is made of stainless steel, and therefore it will not rust or corrode, even when subjected to harsh outdoor conditions. Its unique design allows the tool to be quickly and conveniently folded into a handy size when not in use. Try the Verseo 18-Function Multi-Tool today. See how convenient this gadget is to always have around. 18 Functions in One Handy Multi-Tool. Verseo 18-in-1 Multifunctional Stainless Steel Tool offers useful functions such as ax, bottle opener, chisel, saw, file, flathead screwdriver, hammer, knife, pliers, Philips screwdriver, wire stripper, wire cutter and 6mm, 7mm, 8mm and 10mm wrench sizes. Compact Emergency Toolkit. This multi-tool is the ideal companion when going camping or making quick fixes around the house. With 18 functions at your disposal, the Verseo 18-in-1 Multifunctional Stainless Steel Tool is perfect for any emergencies and tasks that come around unexpectedly. No need to carry a toolbox when you can do almost anything with this 18-in-1 multi-tool. Great Gift for Outdoor and Adventure Lovers. If a friend or loved one is into outdoor adventures and camping, then this multi-tool would no doubt make a great gift for them. Get Out of Emergency Situations Fast! Being in an emergency or accident can be a frightening thing. When stuck and unable to get out of the car, use the knife to cut the seatbelt. Break the car window with the hammer and get out of the car into safety. Remember, when breaking the car windows, the four corners and edges are the best points to hit with the hammer. Rust Proof and Sturdy Design. The Verseo 18-Function Multi-Tool is made of stainless steel, and therefore it will not rust or corrode, even when subjected to harsh outdoor conditions. Its unique design allows the tool to be quickly and conveniently folded into a handy size when not in use. Try the Verseo 18-Function Multi-Tool today. See how convenient this gadget is to always have around.